Recycling hydrocarbons from discarded plastics into energy or new products would be an end-of-life scenario that could benefit everyone. It’s estimated there’s somewhere between 250 to 300 million tons of plastics manufactured every year. 10% of plastics get recycled; the rest of it–millions and millions of tons–goes to landfills, or ends up as litter in the environment. Imagine garbage trucks in communities around the world powered with renewable natural gas derived in part by no-cost biodegraded plastics from managed landfills. Despite the best intentions, only 10% of plastics get recycled. Practically everything else ends up in landfills or in the environment; millions and millions of tons of plastics every year. The fact is that anaerobically biodegraded garbage becomes carbon dioxide and methane gas, so if municipalities–and we, the people who live in them–desire to be good, socially responsible citizens, and do our part to reduce carbon emissions, it’s important that our cities, towns, and hamlets implement modern landfills, whether public or private, to capture these gases in landfill gas-to-energy programs. 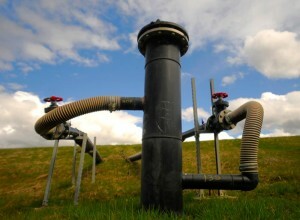 Most modern landfill environments are either moist or actively managed; which means that the landfills accelerate the biodegradation process to produce energy in the form of CO2 and methane, which can then be used to produce renewable natural gas (RNG) energy to propel biodiesel engines or other such uses. With this new scenario, instead of banning bags, communities would encourage merchants to use them. The value of the energy from the biodegradable bags and other biodegradable plastics could quite possibly pay for upgrading the landfill technologies, and create new jobs for the people who manage them. Customers would enjoy the convenience of low-cost plastic bags and bottles. Merchants would enjoy a low-cost service that is eco-friendly and sustainable. The plastics industry would continue to operate with a minimally disruptive technology and municipalities would expand a free source of renewable energy.